You and your partner have good reason to worry. According to the 2005-2006 College Board numbers, a college education currently averages over $5,491 a year at a four-year public college, and nearly $21,235 a year at a four-year private school. Looking at the Ivy League? Four years of tuition, fees, and room and board can now cost $125,000 at elite schools like Harvard and Yale. And costs keep rising: the College Board’s 2005-2006 figures show that public and private institutions raised their tuition and fees an average of 6% in just one year, which far outstrips the national average rise of inflation and wage increases overall. Prepay Tuition — Some state universities have set up innovative programs where college expenses may be made in installments over many years, prior to attending the school. This may be a convenient way to meet expenses, but it takes the choice of school away from your child. What if your child does not want to attend a state university? This could pose a problem. Borrowing — These days, most people borrow at least a portion of the money needed to cover college expenses. You’ll want your children to look for student loans with special lower rates and repayment terms for college. However, repaying a large loan for many years after graduation can be a burden for recent graduates. Tapping into your 401(k) plan may be an option, but you’ll want to take a loan rather than a withdrawal to avoid tax consequences. Of course, a loan will impede the potential growth of your retirement nest egg. 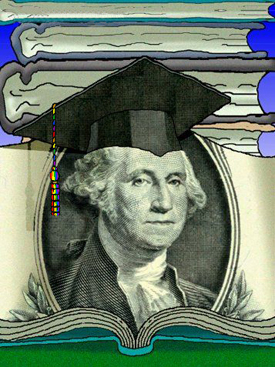 Financial Aid — There are billions of dollars available each year in scholarships, grants, and work-study programs. Financial aid to middle income families may be tough to come by, but it’s worth contacting your child’s high school and prospective college financial aid offices to see if you’re eligible. If your family is comfortable in coming out to your child’s school, you may wish consult the financial aid offices about filling out the application. Even though you and your partner are not married, if your finances have been co-mingled for more than two years, you may need to report your household income instead of the legal parent’s income. (See article link below for more information on this topic.) You may wish to also consult your attorney for more information. Coverdell Education Savings Accounts — Currently, you may contribute up to $2000 (depending on taxpayer’s income) to a Coverdell Education Savings Account (previously known as an Educational IRAs) each year for each child. The previous limit was $500. Although the contributions are not tax deductible, this money will grow on a tax-deferred basis, and can be used for “qualified higher educational expenses” incurred prior to age 30. Distributions used to pay qualified education expenses are excludable from income taxes. The Adjusted Gross Income (AGI) phase-out limit range for an unmarried taxpayer is $95,000. Limited contributions are allowed for incomes of $110,000. Additionally, it should be noted that if distributions from traditional and Roth IRAs are used to pay “qualified higher education expenses” of the taxpayer or a family member, they are not subject to the IRS 10% penalty normally imposed on distributions taken before age 59-1/2. The Team Approach — With the seemingly overwhelming cost, it may be most practical to finance college through many sources — your personal savings, student loans, financial aid, even a part-time job for your child. Once in school, your child might want to look into paid internships that provide valuable experience and help pay the bills. Every bit will help, but the bulk may still have to come from money the two of you have put away over the years — so it’s essential to make the most of your savings and investments. Start Saving Now! — There’s no better time than the present to begin accumulating funds for future college costs. Time Is On Your Side — If your children are young, or you and your partner don’t have children yet, you can put the power of time to work for you. The sooner you start, the better, letting the wonder of compound interest help build a nice fund. Pay Yourself First — Systematically invest at a regular interval an amount you can comfortably afford. You can have this done automatically through bank drafting and payroll deduction. Speak to your financial institution and payroll department to set up these convenient savings methods. Use Tax Advantages — You can try to maximize earnings and minimize taxes through several tax-advantaged strategies. Investing in tax-free municipal bonds, setting up a trust, and making a gift under the Uniform Gift to Minors Act, or investing in Coverdell Accounts are three ways to possibly lower the tax bite. Consult your tax advisor and attorney regarding these approaches. Don’t Put All Your Eggs In One Basket — Diversification is a key to reducing potential risk. Dividing your money among different financial vehicles can help protect against loss and increase the potential for competitive returns. If your children are still in diapers and you have a long time horizon, you may want to consider a variety of financial products to complement traditional bank products. However, as a gay or lesbian parent you will want to be sure your investments can be transferred to your partner in case of your death. Consult your tax advisor and attorney for assistance in choosing the right financial vehicles for you and your partner. Your children’s future is important to you and your partner. Attending college can be one of the most rewarding times of their life. Ensure that your children will have that opportunity to learn, to grow, to graduate from a fine university. Start accumulating funds today and one day you and your partner may be standing proud at their graduation ceremony. For information on funding vehicles for a college education, please contact Mary L. Stockton, LUTCF, Registered Representative, NYLIFE Securities LLC at 8910 University Center Lane #300, San Diego, CA, 92122, (858) 623-8945.